Digital Clock Portable is a lightweight desktop enhancement utility built specifically for helping you place a digital clock on your screen. This unobtrusive tool runs quietly in the system tray until called upon when it reveals several configuration settings to tinker with. The digital clock can be moved to any area of the desktop, and you can make the clock remain on top of other windows, adjust the opacity and size, as well as change the layout of the clock by selecting from different skins, such as Vintage Digits, Binary Clock, Origami Style, Floral Digits, and others. Digital Clock Portable is a useful and highly customizable piece of software that aims to display the time directly on your computer's desktop in a more visible manner. The main advantage of using this app is the fact that it can be run without any installation. Another plus is the fact that the app does not create any registry entries. Upon launching this lightweight app, it automatically integrates itself with your computer's taskbar. The digital clock that should be visible by default once you start the app can be placed anywhere on your computer's desktop. Either by right-clicking the actual digital clock or its taskbar icon, you can access the utility's Settings section. If until now, this tool seemed maybe a bit too simplistic, by starting to tinker with the provided settings, you will discover that Digital Clock Portable offers way more than meets the eye at first. You can make the app stay on top of other windows, customize its opacity and zoom levels, choose from a wide array of available skins and customize practically every other detail like font size, style, color and texture. Additionally, from the Misc tab, you can setup the app to automatically launch at system startup, choose the time format, the font alignment and even the space between the digits. Up to this point, it is quite clear that you can make this utility look and behave to suit your preferences quite nicely. Consequently, you are bound to like this app even more since it also comes with a set of integrated plugins. As expected, with the help of these plugins, you can easily enhance the overall functionality of the app. You can make the app display your computer's IP address, emit hourly or half-hour signals, change the tray icon's color and even add notes. 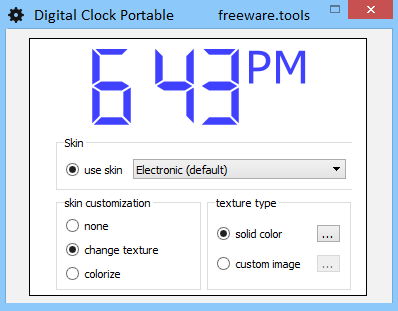 All in all, Digital Clock Portable is an efficient utility that can be handled by novice and more advanced users alike, that offers a great deal of customization options, a useful set of plugins and, even better, can be carried on a flash drive and launched on almost any Windows computer, without requiring any type of configuration.